This simple crisp is a sweet treat for breakfast or dessert (recipe here). The wild blackberries are usually ripe about now, if there are any. Most years the bushes along the roadsides and in the fields are covered with showy white blossoms in spring, giving us the impression that soon the canes will be heavy with jewel-like fruit. But somewhere in between the flowers and the picking season the rain usually stops, and if any berries do form, they're often small and pungent and full of seeds. One year I went berry picking out past Donkeyland with baby Cary (who is doing fine by the way), and even she wouldn't eat the tart little ones we found. Another year I found some berries while driving through a friend's field that were nearly as big as my thumb. He pulled the truck right up next to this giant bramble patch, and I picked my fill right through the window. I should have looked in the bed of his truck for a bucket. This year blackberry season arrived, along with most everything else, about three weeks early. We didn't get any berries, but some of our friends have secret picking places and they managed to score some juicy loot. One of our Amish friends said that they found "a few," and then added that his wife, "put up about 75 quarts." When I mentioned that the 12 locally picked quarts I'd bought last summer at the one store in town were really small and seedy, he said he's noticed that there are two kinds of wild blackberries that grow around here. Some have five leaves and some have three, and even if they're small from lack of water, the berries on the three-leaved variety don't have many seeds. I need to do some investigating. My favorite pie is blackberry, and when I'm lucky there are wild berries for my birthday, which is next week. 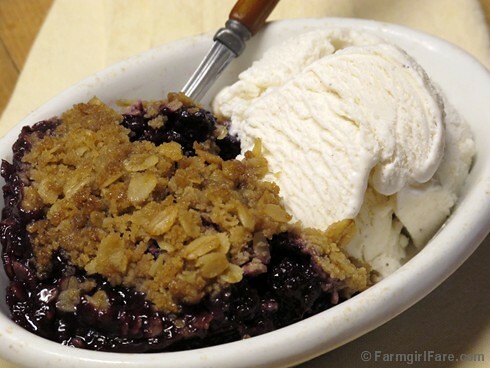 When I'm feeling a little less energetic, I make this old-fashioned blackberry crisp instead, an easy recipe that should not be saved just for special occasions. It even freezes well. Someday I will have a cultivated blackberry patch. Last year I bought two locally grown blackberry plants and two raspberry plants from the feed store, but I still haven't put them into the ground. I know from past experience that I need to find a spot that is sheep and weedeater proof. In the meantime, they've been transplanted into one-gallon pots and are looking pretty good. Wild blackberry season in rural Missouri may be unpredictable, but life in very small town America doesn't change much from year to year—and that's just fine with us. Wishing you a very happy Independence Day, wherever you are in this big, beautiful, bountiful country of ours. It really is an amazing place, isn't it? © FarmgirlFare.com, the all-American foodie farm blog where homemade apple pie ranks a very close second to blackberry. I don't think I've ever had blackberry crisp, but it sounds fantastic. Happy 4th of July! It is over 100 here so I am staying in the air-conditioned house! Berry pies and crisps are some of my favorites! We have wild blackberries growing around us here in the Sierra Foothills of California, but as you say, many years they are small and very seedy. I have had success with cultivated blackberries and especially boysenberries, but not with raspberries or blueberries. I think we are too dry here and I am too lazy to water and cultivate enough to take care of them properly. I know you will plant those berry starts "soon". Like everything I do around here is done "soon". Ha! My girlfriend always brings me wild blackberries from her summer place up in the national forest north of here, YUM!! Let us know what you find out about the five-leaves, three-leaves thingy. Happy 4th Susan and Joe! This crisp sounds devine. I'm a boysenberry girl, but blackberry is a very close 2nd. I planted boysenberry plants I scored from Ebay from SoCal and planted in my fenced Connecticut garden, which are ripening nicely. Verrry high hopes.. birdies be gone :). Good luck scoring lovely berries for your birthday, and Happy Early Birthday to a favorite person! (thanks for the terrific recipe)! Old-fashioned "crisps", using whatever fruit you wish (like apples, for instance) don't call for oatmeal. Those are the new-fashioned versions. It is just flour, sugar, salt and cold butter cut in until the mixture is crumbly and poured over the top of the fruit. If you are using a fruit that has very little natural juice in it, pour about 1/4 cup water down the side of the pan just before putting it into the oven. Someday I must grow blackberries and blueberries. In the meantime, I'll enjoy the store-bought to the hilt. I have a few of each right now, so I'll make a crumble topping that will work for both. The best crisp and crumble toppings have oats in them, IMHO. AND a scoop of ice cream! It looks wonderful. My grandmother used to make Blackberry Cobbler for us during my childhood. Out here in the PNW, blackberries are weeds on the roadside. My dad took out our blackberry plants several years ago in the name of de-weeding the yard. I miss picking them and eating them right off the bushes still. This looks delicious! I have a bunch of blackberries saved up in the freezer just waiting for the right recipe. I might give this one a try! Whilst you all seem to be sweating it out in America, we are nearly drowning in rain here in northern ireland. We have had so much rain my poor strawberries are pathetic and mouldy. our blackberries are still only at the flowering stage, but i do love that dessert. I think it is what we call crumble. i throw porridge oats in and brown sugar, poss some cinnamon in the topping too, if I was doing a blackberry and apple crumble. My only fruit doing well this summer is raspberries. Thanks for all the fun blackberry comments!